If you’ve ever seen infants grab hold of a new object, you’ll know the first thing they do is squeeze it, twist it, bang it, smell it, and probably taste it. This inclination to explore - to get up close, to touch, to inspect, never leaves us, and is integral for learning. Similarly, when you want to learn something, you do a fair amount of exploration. Prior to purchasing a phone, let’s say, you’ve probably gone online, where there is a massive amount of information in a variety of forms: text, video, images, audio. After looking at product videos, reviews, illustrations, and pictures, the next stop would be into a phone store to take a look at phones in person. And not just one, probably lots of phones. That’s because we as learners need not just one model, but lots of models. And the more we can interact with those models to explore them, the more we’ll learn. As a matter of fact, this exploration is a well documented phase of the learning cycle: the more we explore, the more we understand. Every part of Katherine Smith Elementary was in alignment with its core principles and habits of 21st century learners, and this alignment was visible everywhere you looked. Classrooms had posters aligning the habits to the academic standards students learned in their PBL projects; staff and parents practiced and used these habits as criteria for decision making in the classroom and across the school. Students, who had leadership roles as guest ambassadors or tech geniuses, reflected on their personal growth in these roles using the habits. Even the art on the walls embodied the habits that would prepare students for college and career. Additionally, teachers and students made their learning process visible through artifacts hanging on all of the walls of a classroom. From project walls to student work, we could immediately determine the depth and breadth of learning that was taking place in the classroom. 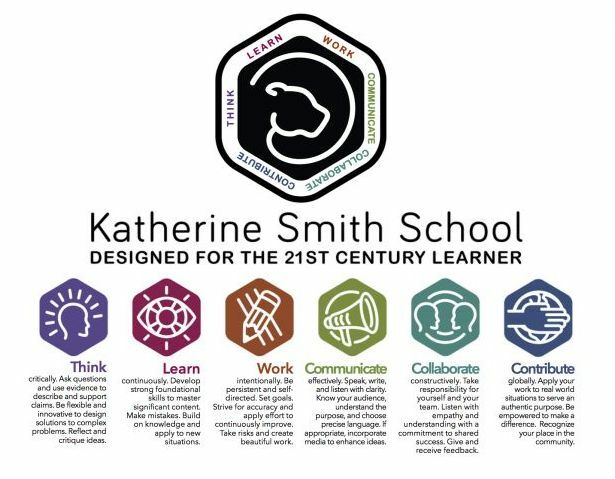 Through conversations with staff of Katherine Smith, we learned of a critical philosophy that drives their culture: everyone is a learner. One of our San Leandro staff members noted “the commitment to PBL that all of the staff shares together. The amount of collaboration and coherence that is going on at K.S. is astounding. I was also impressed with their humility, and how honest they are about the fact that making mistakes is a part of the learning process. As educators, we often ask our students to show that level of comfort, but many adults themselves fail to acknowledge their own mistakes. Hearing from them that it is okay for your first PBL to be less-than-stellar was really freeing and encouraging.” Families, teachers, staff and students are all seen as important stakeholders, and are provided with multiple opportunities to participate, learn and lead. Listening to a student panel and interviewing individual students made it clear that they had not only learned, but that they knew about the process of learning. One of our San Leandro teachers noted that “students all know the parts, steps, and language of the PBL project.” They could also recount what they learned through a project, but also the obstacles they faced, and the solutions they developed as they refined their understanding of particular topics. They spoke using the academic language from and across multiple subjects. ​"What stood out is that we have everything we need to go forward with full implementation. We are closer than we think..."
We left the experience feeling satisfied and energized. For many of us, developing a picture of what PBL is and is not was helpful, but just hearing that “we’re on our way” was soothing. This visit was a chance for our SLUSD team to explore and calibrate, to check in on our own definitions and experiences, to see something that has possibly only existed on paper, right up close in person. For some of our staff, next steps included sharing photos and new understandings with colleagues; for others, connecting to families or finding a time to complete their own PBL projects in the Spring. For all of us, new, deeper questions have emerged, and a sense of excitement to continue on this journey.